The vision of Simply Sussex is to make a positive difference through volunteerism. Due to the heavy rains I am canceling Simply Sussex for this Saturday. We will finish the project in August and I will send out a reminder as it gets closer. Another month has passed and it is time for our July Simply Sussex date and project. 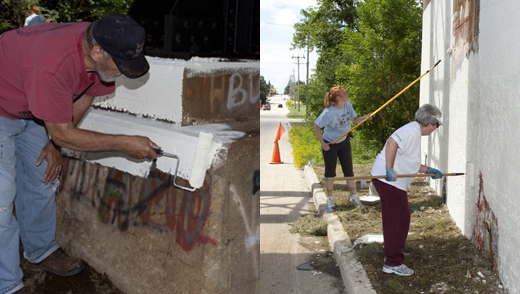 The date is July 24 at 9:00 a.m. We will finish the project that we started in June and that is removing graffiti from the trestle on Waukesha Ave. and giving it a fresh coat of paint. Supplies will be provided and due to liability issues we will only be able to paint the graffiti we can reach from the ground. You may want to bring some bug spray. Certainly we can use extensions on the rollers, so expect the tallest people will be recruited to paint as far as they can reach. The area is on Waukesha Ave. about 2 blocks north of Main Street. You can park in a small overflow parking lot behind Sussex Inn or street parking on Elm Street and Waukesha Ave.
Hope to see you on the 24th weather permitting! A collaborative community initiative to partner with you by cleaning up our parks, trails and waterways. The focus is to help keep our Village vibrant. Our mission statement will be a living, changing document, based on the needs of the Village. Short-term goals for the summer and fall of 2010 will be to enhance some of our 14 neighborhood parks and our trails , by weeding, picking up trash, and painting just to name a few. We will be also be doing a joint project with Girl Scout Troup 4057. Each volunteer needs to bring a rake, shovel, or anything you find helpful in your own yard (no power equipment). The Village will provide trash bags, ice, water, and a staff person to pick up our trash at a central point. The Village of Sussex will require you to sign a waiver along with an emergency telephone number. Sign up for all 5 Saturdays and make only one call or send one e-mail. If you are available specific dates, let Pat know one week in advance. Long-term goals would be addressed as needs arise or you may adopt a section of roadway, sidewalks, or trails in your neighborhood and keep it sparkling. Good deeds lift spirits dramatically. When they are done in succession, volunteers experience even greater happiness. © 2010 Simply Sussex. All Rights Reserved.